You will be able to experience various types of Japanese architecture, onsen, washoku (Japanese cuisine) and yukata, if you stay in a ryokan. 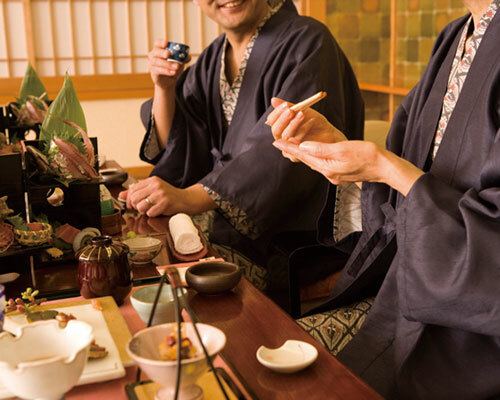 A variety of different types of accommodations, such as well-established traditional ryokan and large hotels, are available at Iizaka Onsen. 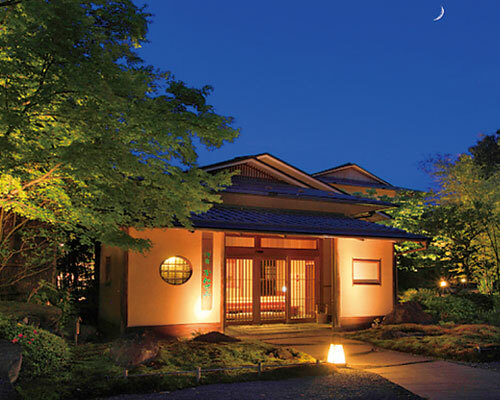 Enjoy the accommodation of your choice with Iizaka Onsen-style hospitality, Japanese cuisine and open-air baths. 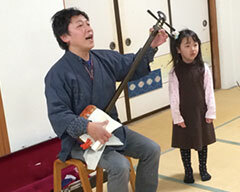 The fifth generation owner performs Futozao (broad neck) or Nakazao (middle-size) shamisen upon request. 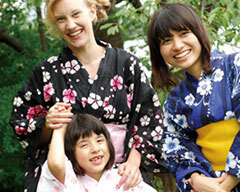 Rental yukata for women and children are available at the following ryokan. They can help you get dressed in a yukata, and those who are not staying in their ryokan are also welcome to use the service. Conveniently located next to the station. A small inn for business travelers and sightseers. Rotenburo (Open-air bath) overlooking Surikamigawa River is available. 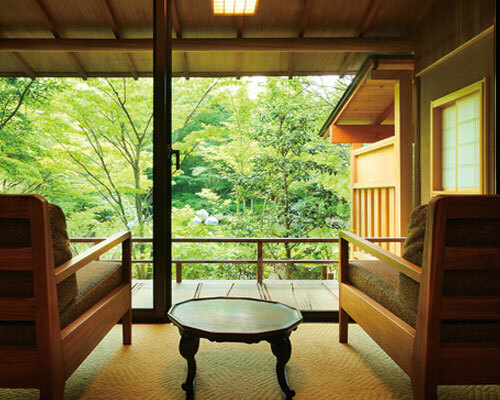 A traditional sukiya-style (incorporates a number of tea ceremony house features) wooden rooms are available. 19th century architecture registered as a cultural property. Taking pride in home-style cooking. Established in the 19th century. A 3-story wooden building with atmosphere. Various types of cuisine, including buffets. An inn with a matsuri (festival) atmosphere. Rotenburo is available. A place you can experience the rich nature of the seasons. The onsen is direct from the source. Taking pride in seasonal cuisines. Rotenburo water is direct from the source. Free-of-charge to charter a bath. An inn that specializes in vegetables and sake. Has a Japanese Garden, and serves special cuisine. A small inn with a charter bath available. Taking pride in its cuisine. Many view rooms. Rotenburo made of cypress wood, with a view. 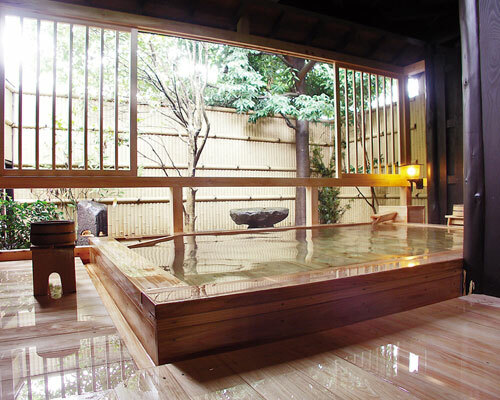 An onsen direct from the source. Near Surikamigawa River, an onsen. Onsen direct from the source. An inn with a half-century old atmosphere. 5 hot spring baths direct from the source. The same price all day.Spacious bath overlooking Surikamigawa River. An inn taking pride in its cuisine. Hospitality with smiles. Spacious bath for charter. Enjoy beautiful scenery overlooking a valley. Nostalgic atmosphere. An inn surrounded by nature. Hot spring direct from the source, overlooking a valley. * Accommodation costs are average costs per person, when two guests stay in one room for one night, including two meals on weekdays. * Please ask on arrival for the cost/hours of baths for day-trippers. * Information listed above is current, as of February 2019. Costs etc. may change without notice.